The just concluded primary elections of the ruling All Progressives Congress (APC) shook the party in Lagos State, following controversies that marred the shadow polls used by the party to elect its candidates for 2019 general elections. While the presidential primary was violence free, that cannot be said of the governorship, national and state Assembly primaries, which were marred by accusations and counter-accusations. The presidential primary held on September 28 was peaceful as party faithful participated fully in the exercise in the 245 wards in the state to elect President Muhammadu Buhari as APC’s presidential candidate for the 2019 general elections. Lagos APC during the primary proved its worth in Nigeria’s politics by giving President Buhari 1.9 million votes. But, the peace which the Lagos APC enjoyed during the presidential primary was not repeated in the governorship, senatorial, House of Representatives and House of Assembly primaries as party leaders and members engaged one another in war of attrition. 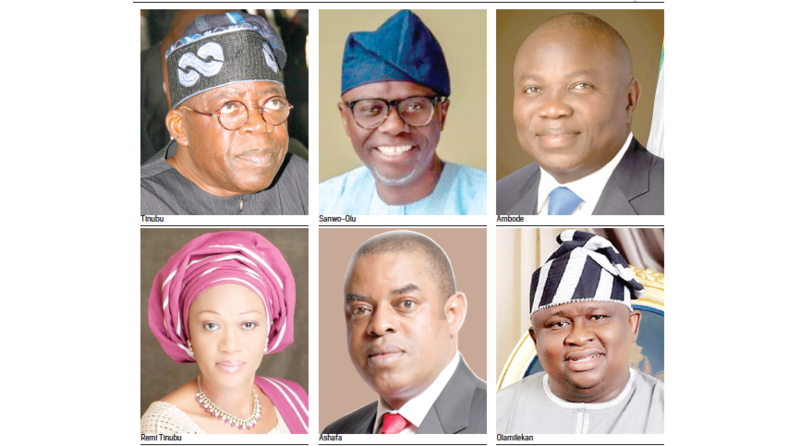 The Lagos APC governorship primary witnessed a lot power tussle among political gladiators in the state, who used the primary to prove their worth in the state’s politics. The contest later became a political battle between the state governor, Mr. Akinwunmi Ambode and his godfather and benefactor, Asiwaju Bola Tinubu. The governor, however, lost the battle and that marked an end of his hope of extending his tenure as the number one citizen of Lagos State beyond May 29, 2019. Tinubu against all odds during the 2015 general elections backed Ambode to become Lagos State governor, but the relationship between the two suffered a major setback over plot by the APC national leader to stop Ambode from getting return ticket. What many people initially saw as a child’s play turned to reality on Monday September 9, when Governor Ambode and two other people – former Commissioner for Works, Dr. Obafemi Hamzat and Managing Director/CEO of the Lagos State Development and Property Corporation (LSDPC), Mr. Babajide Sanwo-Olu picked APC governorship Expression of Interest and Nomination forms at the party’s national secretariat in Abuja. While some APC leaders endorsed Ambode during his declaration shortly after he picked the governorship forms, the political calculation changed later the same day, when some APC leaders on the aegis of Mandate Movement led by the immediate past Lagos APC deputy chairman, Cardinal James Odumbaku, endorsed Sanwo-Olu as the incoming governor of the state. The official declaration of Sanwo-Olu on Sunday September 16, generated excitement in the party as many saw it as a clear reflection of where the pendulum will swing during the party’s governorship primary. Having seen the handwriting on wall that the political calculation is not in his favour, Governor Ambode made several moves to reconcile with Tinubu and other APC leaders working against his interest, but the moves did not yield positive fruit. The failed reconciliation move, notwithstanding, Ambode was determined to fight till the end. He was not even moved by Tinubu and the GAC’s endorsement of Sanwo-Olu at a stakeholders’ meeting held at the party’s secretariat as well as Hamzat’s decision to withdraw from the race and back of Sanwo-Olu. The state governorship primary held on Tuesday October 2, witnessed a lot of drama. Thousands of APC members trooped out en masse to participate in the exercise, but the Lagos APC Governorship Primary Election Committee led by Clement Ebri during a press conference held at the Protea Hotel, Alausa, Ikeja, disassociated itself from the election. While the committee said it did not conduct the primary, the Lagos APC executive, in a swift reaction, announced the result of the exercise and declared Sanwo-Olu as the party’s governorship candidate. Lagos APC chairman, Alhaji Tunde Balogun, at a press conference held at the party’s secretariat on Tuesday night, said Sanwo-Olu scored 970,851 votes, while Ambode had 72,901 votes. In what seemed to be a dramatic change of mind, Ebri few hours later aligned with Lagos APC’s decision by declaring Sanwo-Olu winner of the governorship primary. Ebri declared: “After resolving some of the hiccups, the Lagos State APC Governorship Primary Committee collated the results from the 245 wards in the 20 local government areas from the collating officers. At the end of the exercise, these are the votes scored by the aspirants: Governor Akinwunmi Ambode 72,901 and Babajide Sanwo-Olu 970,851. Governor Ambode later took many people by surprise during a state broadcast on Lagos State Television (LTV) by congratulating Sanwo-Olu and accepting the result of the governorship primary. His decision doused political tension in the state and without any iota of doubt carved the nerves in Lagos APC. Speaking on the governorship primary, Lagos APC Publicity Secretary, Mr. Joe Igbokwe, dismissed the insinuation that there was no primary conducted in the state. “It is a lie from the pit of the hell for anybody to say that Lagos APC did not conduct governorship primary on Tuesday. I participated in the exercise in my ward and it was peaceful, fair and credible. The primary has come and gone; what we are looking out for is the campaign,” he said. Also speaking to journalist on the outcome of the primary, an APC chieftain, Hon. Lanre Ope, said the outcome of the election is the reflection of the people’s will. He also commended members of the party for coming out in large numbers to elect Sanwo-Olu as their governorship candidate. The APC’s national and state Assembly primaries also witnessed lots of protests, violence, accusations and counter-accusations among the aspirants. There was also confusion over winners of the primaries as many of the aspirants went public to declare themselves the party’s candidate. According to the results of the senatorial primaries announced on Saturday at a press conference held at the party’s secretariat by the Chairman, Electoral Committee of the National Assembly and State House of Assembly primaries in Lagos State, Mr. Lucky Imasuen, a member of the Lagos State House of Assembly, representing Kosofe Constituency I, Hon. Adebayo Osinowo polled 247,743 votes to defeat the incumbent Senator Gbenag Ashafa, who had 20,385 votes. But despite the results announced by the party, there is still confusion over the Lagos East Senatorial primary as Senator Ashafa is also claiming victory on account that he is the sole candidate of the party for the election. Senator Ashafa insisted that what took place on the day of the primary election was an affirmation of his candidacy as the sole candidate of the party since his main opponent, Osinowo, had been disqualified by the National Working Committee (NWC) of the party. He said that he was the only Lagos East senatorial aspirant cleared to contest the election on the party alongside the other incumbent senators, Oluremi Tinubu and Olamilekan Adeola of Lagos Central and Lagos West, respectively, adding that being the only recognised aspirant, he is going into the election unopposed. But Oshinowo debunked this, saying he was duly elected and insisted that he was never disqualified from the contest. But, speaking at a press conference, Imasuen declared Osinowo as the APC senatorial candidate for Lagos East and also announced Senators Tinubu and Adeola as the party’s senatorial candidates for Lagos Central and Lagos West respectively. Senator Tinubu emerged unopposed by polling 89,484 votes, while Senator Adeola won with 378,906 votes as against the 1,179 votes scored by Comrade Kayode Opeifa and Mrs. Areago Olopade’s 1,275 votes. Imasuen said the primaries were contested for the three senatorial seats, 24 House of Representatives and 40 House of Assembly seats. He said the details of the House of Representatives and House of Assembly primaries results were ready and that they would be released later. New Telegraph gathered from reliable source at the party secretariat that the results of the House of Representatives and House of Assembly will be announced after the party’s national convention. But as at the press time, the results are yet to be announced by the party. The party’s silence has raised tension as members are in the dark over those who will run on the APC platform in 2019. The silence has also led to protest by some members of the party, warning against imposition of candidates. There is no doubt that the Lagos APC primaries have produced many winners and losers. While some are singing victory songs, others are still mourning their defeats during the shadow polls. Tinubu threw his weight behind Sanwo-Olu and based on his leadership role in the party, the major stakeholders and elected officials, including members of the apex leadership body in Lagos APC, the Governor’s Advisory Committee (GAC) mobilized party members to support Sanwo-Olu. His emergence as Lagos APC governorship candidate is a reward for commitment and hard work. He is experienced on Lagos politics and governance, having had the opportunity to serve three governors as commissioner, special adviser and head of a corporation. Senators Remi Tinubu and Olamilekan Adeola representing Lagos Central and Lagos West senatorial districts scaled through to realize their aspirations to return to the Senate. As APC senatorial candidates, Tinubu is returning for a third term, while Adeola will battle opponents from other parties for a second term. Hon Bayo Osinowo, the APC senatorial candidate for Lagos East is a winner after defeating incumbent Senator Ashafa with over 200,000. He is one of Tinubu’s trusted allies as well as a kingmaker in Lagos politics. The outcome of the APC primaries was not a good story for Ambode, whose name has entered the record books as the only governor in Lagos State who did not enjoy a second term. He was denied the opportunity of extending his stay in the Lagos State government house by the power brokers in the party, who had many scores to settle with him. With the loss, the governor is expected to bow out of office on May 29, 2019. Senator Ashafa’s hope of returning to the Red Chamber for the third time has been dashed with his loss in the primaries. He lost the party’s ticket to Hon. Osinowo.